The night began with a blessing by local Costanoan Ohlone native and activist Ann-Marie Sayers. In celebration of our communities’ creative expressions, Eddie Madril of the Pascua Yaqui tribe dazzled everyone with an incredible hoop dance. With over 500 community members, activists, organizers, scholars, and youth leaders in attendance, Decolonizing Knowledge highlighted the importance of self-determination in any research agenda. Dr. Linda Tuhiwai Smith reiterates that our communities have expert knowledge on both the conditions we face and the solutions we need. 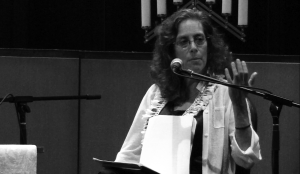 Dr. Michelle Fine explains how the people who pay the highest price of injustice carry the most intimate knowledge on how to design research on that injustice. Dr. Andrew Jolivette explains how radical love, as a practice of Research Justice, is a ceremonial process that leads to the liberation of not one, but all of our communities. 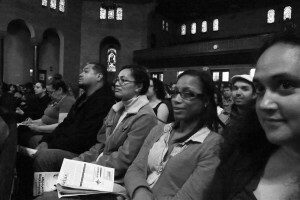 Over 500 community members, scholars, and youth leaders came together in Oakland on Friday, April 26th to learn about, connect with, and celebrate Research Justice, a theory of change DataCenter has developed since 2009 to advance grassroots social justice, self-determination, and solidarity struggles. Moderated by Dr. Andrew Jolivette, Chair of American Indian Studies at San Francisco State University, the event featured an unprecedented kitchen-table-style conversation between activist-scholars Dr. Linda Tuhiwai Smith, Pro-Vice Chancellor Maori at the University of Waikato and Dr. Michelle Fine, Professor at CUNY and co-founder of the Public Science Project. 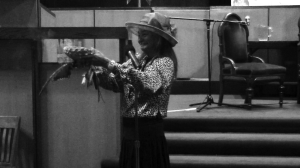 As we stood on Ohlone territory, we were honored to receive blessings by Ann-Marie Sayers, a local Costanoan Ohlone native and activist. Michelle Fine, in her opening remarks, named the uneven information playing field that DataCenter challenges in its Research Justice framework: “Expertise is widely distributed—even if ‘legitimacy’ is not.” She went on to emphasize that though academic degrees mark ‘legitimate’ knowledge experts, we must acknowledge and embrace what we know as communities, through our traditions, experiences, and indigenous languages. 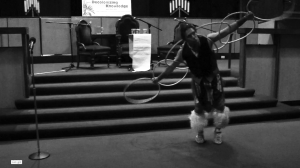 The evening talks were complemented by an incredible hoop dance by Eddie Madril, member the Pascua Yaqui tribe, and Pacific call-and-response songs by Fuifuilupe and Sauliloa Niumeitolu. 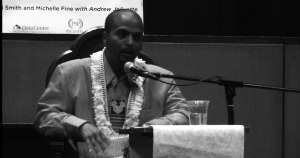 One of the performed songs originated from Pacific Islander brothers in the Solano State Prison in California and was created in an effort to preserve their cultural knowledge and pass it on to the next generation. The evening culminated in the beautiful melodies of Wappo and Dine tribe member Desirae Harp. 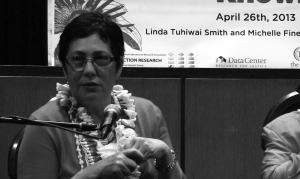 Jill Leilani Nunokawa from University of Hawai’i wrapped up the evening reiterating that Research Justice is about including all voices the creation of knowledge. That we, as communities, can speak for ourselves. We most intimately know both the problems we face and the solutions we need. It takes the expertise of our communities—our elders, our youth, our women and children—to create, preserve, and honor knowledge that is capable of building movements and achieving transformative change. A special thanks goes out to Making Contact at www.radioproject.org for providing the audio and Sean Marshall for providing some of the footage featured in the Decolonizing Knowledge video.